» Where is the Hotel Gea di Vulcano located? 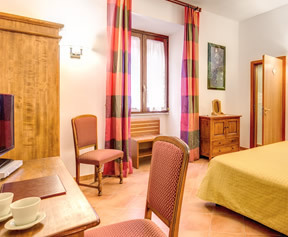 The Hotel Gea di Vulcano provides ideal budget accommodation in the historic centre of Rome. See the Hotel Gea Location page and Hotel Gea Nearby Attractions page. » What does this area of Rome have to offer? The 3 star hotel offers cheap hotel rooms near the Colosseum, the main transport hub of Stazione Termini Rome, Piazza Venezia, Piazza della Repubblica and many more. 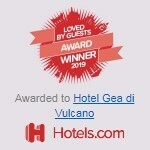 Visit the Hotel Gea di Vulcano Nearby Attractions page for further information. Hotel Gea prices vary according to the season in Rome. Look out for last minute special deals. 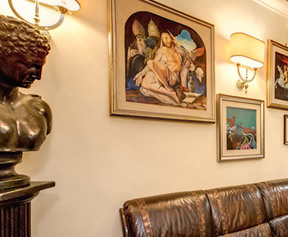 Prices are quoted at the Hotel Gea Rome Special Offers page. » What is the hotel’s policy regarding children? All children under 2 years of age stay free of charge when using existing beds and bedding. Cots can be provided free of charge. Extra beds cost 23 Euros per night. » Does the price include breakfast? Yes, a continental style buffet breakfast is served daily. Guests also have the option of breakfast in bed. 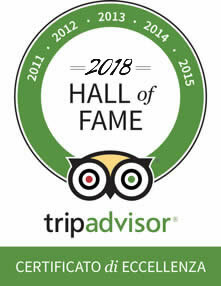 Guests can check in after 12:30 and must check out before 10:00. » Do rooms have shared or private bathrooms? All rooms have their own private bathrooms. » What amenities do the rooms offer? All rooms have air conditioning, tables, hair dryers, sound-proofed walls and television. » Do rooms have air conditioning? Yes, the whole hotel complex is completely air conditioned. » Does the hotel offer internet access? Internet is available in the entire hotel complex - free of charge. » What is the hotel’s cancellation policy? Guests making their cancellation up to 2 days before their date of arrival are not required to pay any fee. If guests cancel later than 2 days before their date of arrival are required to pay the equivalent price of one night of their booking. Yes, we would be happy to organise tours of Rome, museums and Vatican. We can also reserve tickets for shows, concerts and the opera. » Can we leave our luggage at the hotel? Yes, the Hotel Gea Rome offers a baggage storage service. » Are credit cards accepted? Yes, we accept American Express, MasterCard, Visa, Maestro, CartaSi and Diners Club. » How is personal information handled when reservations are made? All confidential information we deal with is handled in compliance with data handling laws. Pets are permitted, however please inform the hotel. » Are taxes included in the stated price? » What type of rooms can I choose from? 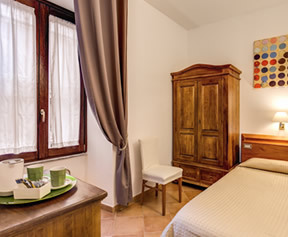 The Hotel Gea Rome offers single, double, triple and quadruple rooms.